Last edited by WingDings; 03-29-2019 at 3:59 PM..
Cordless drill with a carbide bit on that frame? I don't think that is going to end well. My advice would be find someone with a milling machine and do it right.Carbide drills like solid setups, and a cordless is the worst possible situation. I've not drill a TacSport frame, but many of the old Witness frames (different compny, likely different alloy), and they were quite hard. Even at a mid-30's rC I would not do it the way you want, and the frame might be harder than that. Very minimum would be a good quality cobalt bit in a nice drill press, with good quality cutting oil. If something goes wrong you'd have a chance to save it. Getting a broken piece of carbide in a frame will ruin the next thing you use to try and get it out, unless you use an EDM. That's a whole 'nother effort. I've been a machinist more than 40 years, and had plenty of learning experiences. No need for you to have one on that nice gun. It's a muzzle BRAKE, not a muzzle break. Or is your muzzle tired? If Randall AR15 Barrels is available, I would suggest him. He works by appointment, and I've never heard a bad word about the quality of his work. I'll hardness test a TacSport when I get a chance, to see what we are dealing with. 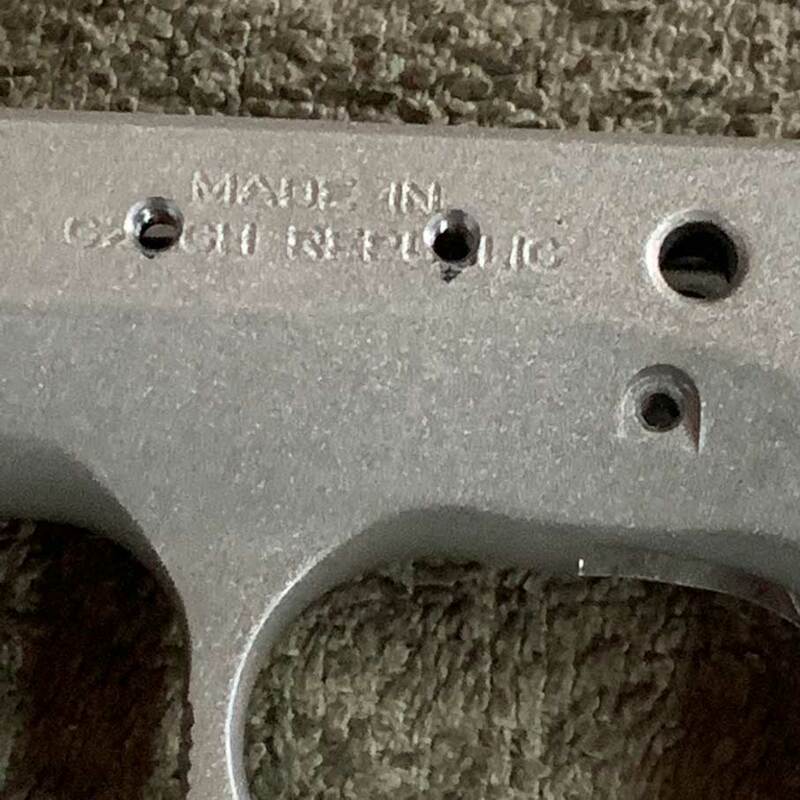 Frames are usually not case-hardened, so it'll be good info. Decent drill bits are usually not cheap. You might be able to come up with something off eBay (I have at times), but you might not have the background knowledge (yet) to know how to choose. There's sub-categories, variances in quality and alloy blend, to make them more suitable for different applications. Someone might be along that has done one before, and will do it for minimal gratuity. Take it to Randall if you want a nice job. If you do it yourself pls take before and afters. Just take it to someone with the proper tools, experience and know how. It's not a hard job but if not done right you will regret it. Ever see one of those threads where someone had something stuck in their barrel? They try a dowel and it breaks. Then they shove a rod in and that breaks. Then they hit it with a punch and lodge it in there good. Then they do something someone on a forum told them and then FINALLY they cave and take it to a gunsmith. For the price of even a cheap press, you can have someone do it that knows how to properly use the tool. If you're interested in learning something in the process, ask if you can hang out to watch them do it. All great advice, but I don't have a drill press. Seems like it might be a better idea to get it taken care of with a professional who has the proper tooling. Then again, they aren't that expensive. And whether they line up well enough for you to screw in the thumb rest is another story... Let's say that's another 50/50 proposition, then your total chances of getting it all right is 50% x 50% x 50% = 12.5%. With a laser?! Wonder if it’s on the roster?! +1 on letting someone else do it for you, possibly watch and learn for next time. "That's more suspicious than a nun doing squats in a cucumber field!" Going to Randall is the right call. As for which screws to use, I believe he has both metric and standard taps, so it will be up to you to choose. But bring both just in case. Randall is great. Poet pics when it is all done. 3. Any other advice for an amateur garage gunsmith? Yes,.................don't try precision work with hand held cordless drills. That is inviting impending disaster. At the very least, get a cheapy chinese Harbor Freight bench top drill press. I feel like I'm improving every single day with the cordless since the great ACOG disaster of 2016 ("nothing a little puddy can't fix")...but I understand the sentiment. Thanks. Your work looks fine. I’d say go for it! It is very easy job with right tool. It will take about 15 minutes or so on milling machine and right clamping fixture. Do not do it with cordless or corded hand drills-you will screw up frame. Call Randal, make appointment and he can do it while you wait. Every penny you will pay to him to do drill/tap-will be really good investment. Another option will be CifaldiPrecision. He is specializing in 1911s, but this kind of job is piece of cake for him. 1. Thank God I didn't attempt that on my own. 2. Digital gauges and the proper machinery / tooling are a man's best friend. 3. Randall does fantastic work. Bonus: CZ Tactical Sport trigger pins require a punch stronger than a toothpick. Good deal. It's important to have the right tools for some jobs. It's crucial for jobs like this.